If you celebrated a little too hard yesterday, take a look at my recovery post from earlier this week. I know our neighborhood was ba-nanas last night, I was dodging wannabe leprechauns all the way to the grocery store. One thing thing that I often crave on weekends is...MEXICAN food! This girl cannot resist some chips, salsa, queso, guac, margaritas... Clearly, I could go on. One of my favorite ways to healthify Mexican is to pull out my inner chef and get cooking at home. One of my very best friends, Megan, taught me how to master the art of enchiladas my first year in Chicago. Thank you, Megan!! :) I've tweaked the dish a little along the way, to make it a little more waistline friendly since I do make it so much. This one is definitely a crowd-pleaser and it makes for AMAZING leftovers. 3 Medium Sized Boneless-Skinless Chicken Breasts -- Aim for about 1 to 1.5 pound, cut into small (1/2 inch) cubes. Fajita Seasoning: If you're in a hurry, buy a low-sodium pack from the store, or, do what I do, make your own! It is super easy and you will feel chef-tastic. 1/4 tsp. Red Pepper Flakes (you can add more, depending on how spicy you likey). 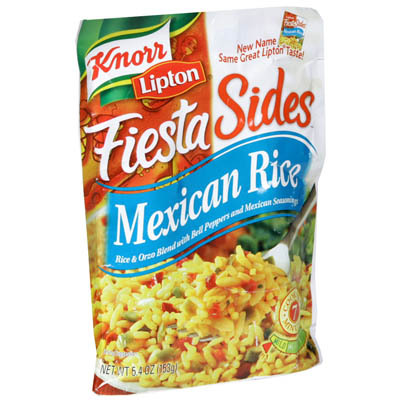 1 to 2 Cups Lower Fat Shredded Mexican Cheese -- If you're a Dominick's shopper, I choose Lucerne 2% Shredded Mexican Cheese. 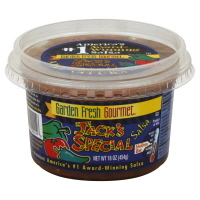 Small Container of Salsa -- My favorite is Jack's Medium Salsa, just can't get enough of this stuff. Enchilada Sauce -- You know the drill, find something lower in sodium at the store (you'll need 1.5 cups), or channel your inner Emeril and make your own. Click HERE for my go-to enchilada sauce recipe. Step #1: Preheat your oven to 350 degrees. Step #2: Cook your rice. Whatever rice you choose, just follow the directions on the box/bag/packet. Step #3: In a 12-inch skillet spray some PAM or add 1 tbsp. EVOO. Add the chicken and your fajita seasoning (if you bought a packet, follow the directions on there). Cook for about 7ish minutes until the chicken is no longer pink in the middle. Step #4: Now you're ready to roll 'em up. WARNING: This can get messy! Put about 1/4 a cup at a time of your enchilada sauce on a large plate. Take 1 tortilla and dip both sides in the sauce on the plate until well covered. Then, transfer tortilla to another plate or a large cutting board. Start with the rice. 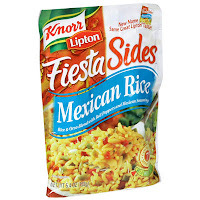 Line about 1/4 cup of rice in the middle of the tortilla. Top the rice with some of the chicken (maybe about 1/3 cup?). Cover the chicken with about 2 tbsp. of salsa. Sprinkle some of the Mexican Cheese (a couple of spoonfuls) on top of the salsa. Now, take one edge of the tortilla and bring it over the top of the mixture -- and start rolling! If you're going for 8 enchiladas, your going to need to roll them tightly! 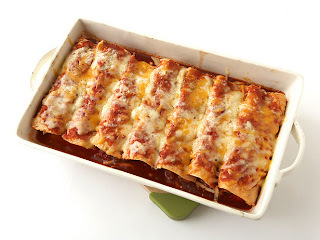 Once it's rolled, place the enchilada seam-side down into a 13 by 9 inch pan (I use a glass Pyrex pan). Repeat times 6 or 8 depending on how many you're making. Step #5: Once all of your enchiladas are in the pan, cover them with some more enchilada sauce (if you bought a little can, use the remainder. If you made your own, drizzle about 1/2 a cup at a time to your desired coverage). Then top off the whole dish with the remainder of the Mexican cheese. Step #6: Pop your fiesta into the oven, uncovered, for 15 minutes, until the cheese melts. Step #7: Let them cool, serve, & enjoy! :) You can even top your enchilada with a small spoonful of low fat sour cream (I like Daisy Light). If you'd like to sip on a margarita with this recipe, try this amazing invention from Bethenny Frankel: The SkinnyGirl Margarita! Only 100 calories per serving! Where's my sombrero?!?! If you can't find the pre-bottled stuff at your store, don't fret! You can order a bottle (or two!) 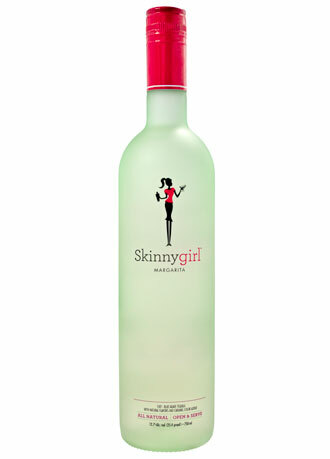 online, or you can make your own SkinnyGirl margs with this recipe. So delicious and refreshing! Hope you all have a fantastic weekend! Mine is set for some good times with some GREAT friends :) I'm pretty pumped!